Keynote presenter Jim Knight implored those attending the Facilitator Forum on Leading Professional Learning to have respectful, authentic conversations with peers. Alluding to research on the topic, keynote presenter Jim Knight shared with those attending the Facilitator Forum on Leading Professional Learning that more than half the students in the United States are convinced they are not being heard, and that their teacher doesn’t know their name. Working this into his address, Knight underscored the overall troubling trend he sees, while insisting that there needs to be conversation and relationships in order for society as a whole, and education specifically, to get back on the right track. “We are not at our best if we’re not connecting with other people, and kids need to feel a sense of belonging. A relationship is a living thing. You develop it one encounter at a time, and we all need to remember that everyone counts. So you need to be a good listener,” he said, noting that the latter has become an all but lost art for some people. “Having better conversations is a movement toward a more authentic version of yourself. You need to see others as equal partners in the conversations. It’s about equality; if you want better conversations, it is important you see the other person as one who counts. Remember, all people matter,” Knight suggested. Knight, who is based in Kansas but a native of Canada, acknowledged that this indifference or intolerance for others’ viewpoint is particularly acute in the United States, beginning with President Donald Trump. Knight labelled the current-day climate as sufficient reason for him to believe there is a communication crisis on a wide-scale basis. He added that if people are not growing in terms of how they communicate, our lives are impoverished. 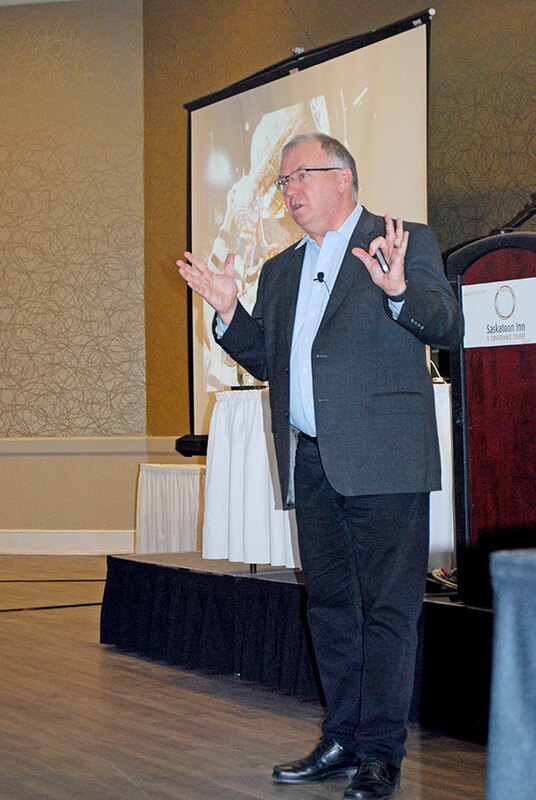 “We need more connection, and we tend to lack empathy and intimacy,” he said, in what was an interesting blend of off-the-cuff humour and serious messaging for the 120 educators in attendance. Honing in on his audience, Knight insisted that “communication is central to improving a school, and schools are only as good as the conversations that are happening,” he said, adding that it starts with school leaders. “If you’re a teacher with 30 students in your classroom it’s a challenge, but that’s part of the profession. Kids are far more likely to have success if they feel connected to school, they matter and that they are being heard,” Knight added. Asked afterwards in an interview how some people might not readily identify their own shortcomings in such areas, Knight suggested video taping conversations. “You can’t get better unless you know yourself. So to me, playing back that video of a situation gives you a clear picture of where you are and what you might need to work on,” he said. According to Knight, the importance of having positive conversations and collegial relationships is paramount to developing positive energy. Knight bemoaned the climate that he too often finds in the United States; labelling it as a fact that interruption is accepted as the norm, while maintaining hope that the current climate is just a cycle.